Don't Eat the Paste: Coolio! 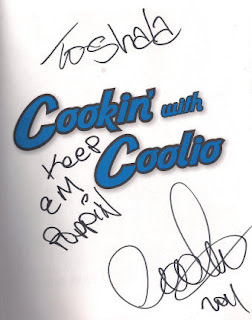 When the Cookin' With Coolio cookbook came out, I got a copy to review. This is what my original review said about it. "I know a lot of the people who order this are going to order it for the novelty factor. It is novel, and it's laugh out loud funny to read. Coolio keeps his spices in dime and nickel bags and it's the first cookbook I've read that needs a language warning. But getting past the novelty into the recipes because I love to cook, this book is full of easy to prepare good food. His stated goal is to get people eating healthier and being less dependent on fast food. With that in mind, a lot of the recipes are inexpensive and have minimal prep work. 10 minutes of prep and most of them cook up pretty quickly. So you have food that's faster than getting in your car and driving to a burger place. Most of it is a lot healthier too. Use your judgment, if it calls for a cup of mayonnaise, it might be unhealthy. The recipes use a lot of canned foods and sauces to make it quick and easy. There are some very healthy options as well that look absolutely delicious. I'm looking forward to trying the chili for my family. There are some very tasty vegetarian meals and options. The shrimp recipes look amazing. I've used the fork steak recipe after seeing it on his cooking show and it was a huge hit with my family. He states anyone can make a good expensive steak, it takes true kitchen skill to make a good steak with a cheap cut of meat. I appreciate that philosophy. Learning the basics of cooking can make budget cooking way better than what your friends do after seeing a gourmet show and trying with the costly things. About cooking basics- he doesn't go into great depth but he does explain the terms and methods very well including not assuming his readers know how to boil an egg. The recipes are adaptable, basic recipes that will serve well in any home kitchen and could quickly become comfort food standbys and some of them are easily impressive enough to serve to guests with a more formal presentation. It appears Coolio doesn't eat pork, so a lot of the recipes call for harder to find things like beef bacon, if you do eat pork, you can substitute regular bacon. The rest of the ingredients can easily be found at any big grocery store." I love this cookbook. It's fun, it's easy, it's a fantastic cookbook for people who don't want to fuss too much with meals. The flourless peanut butter cookies are amazing. Coolio also has a cooking show available on YouTube so you can see how he makes some of the recipes. Scantily clad women, language and other various warnings you might expect. Plus it might make you laugh really hard if you like his quirky humor. So, why am I bringing it up a year and half after the cookbook came out? Because of this! He was in town for a concert, and stayed at the hotel my husband works at. My husband, who never asks for autographs offered to bring my cookbook to work and see if he could get it signed. Amazon links are affiliate links, and help support my book addiction and this site. Testing out settings on blog comments.